I need a favour from you. Yes, You. Having spent many years as a giver in a relationship and not learning how to prioritise myself and my well-being when making decisions has left me in a disadvantaged position. When I enter a relationship with a guy, I end up giving so much that I forget to think of getting anything for myself in return. That is what I need help with. I need to look at a situation and realise that I shouldn't be wasting time on someone who won't waste time on me. I can not be the only one who gives and changes and adjusts to how the other person runs things. You, my friends, must remind me that it is far better to be alone and be myself than to live a life pleasing someone else and never being valued in return. It's nothing wrong with the guys. It's me. I just have to pick different kind of men. A nice guy who likes me and treats me well. Surely, he exists. Now is the time to do other things and if he turns up then good. If not, I still have you all. Don't let me fall in to another HE-IS-EVERYTHING-I-AM-NOTHING trap, please. You come first. I spent all my life in relationships adapting, changing, accommodating, putting myself last. Once someone sees that in you, it almost seems like human nature for them to take advantage of you being so "easy going". If it doesn't feel right it probably isn't. Take care. Email, message at any time. 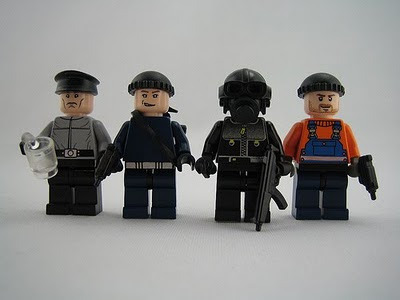 Oh, and can I be Lego Cop with the blender in his hand? Life throws rubbish people at us all the time. You are not one of those and your selflessness is a great trait to have. You are a different person now, you have changed, adapted and grown into a much stronger, happier and capable person. ps: I suspect that you will naturally attract a different type of chap going forward anyway.